My work has always been strongly influenced by the natural world and by the quest to interpret it through close observation. The real drama within nature occurs for me in an intimate relationship between the object and the observer. 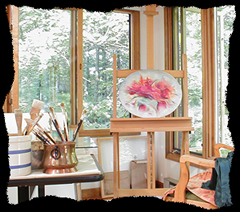 Throughout my career, I have consistently worked both as a painter and as a tapestry weaver. The challenge of looking closely at natural objects to see what their deeper structures reveal and inspire to the creative eyethe manifestations of tremendous natural energy creatively transformed through metamorphosis (e.g. bud to blossom, larva to mature insect)hold a special attraction for me. In my effort to explore the possibilities for abstract interpretation of the minute forms, patterns, and colors revealed to me, I have at various times turned to the complex patterns of microscopic phenomena for thematic inspiration in my work. Nature is, after all, the ultimate model of creative expression, and is the mainspring for the creative impulse, culminating in an intimate relationship which does more than seek faithful realism as its end. My attention is concentrated on the question of the beauty of natural energy as manifested in the final work. These two modes of expression through which I reveal my inner vision--the painted image and the woven tapestry--create a synergy enabling one technique to nourish the other, each in its own time.